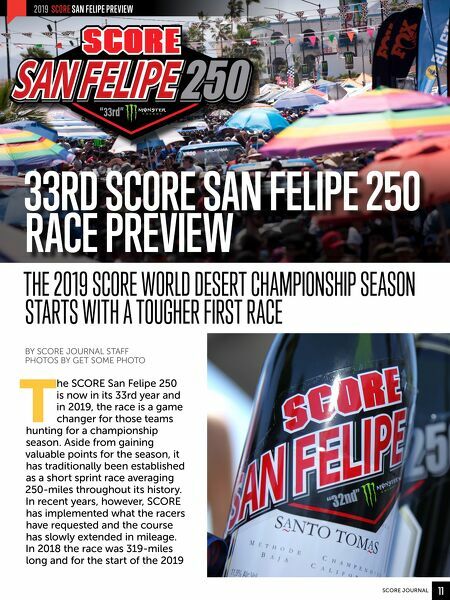 33rd SCORE San Felipe 250 Race Preview The 2019 SCORE World Desert Championship Season Starts With A Tougher First Race By Score Journal Staff Photos by Get Some Photo The SCORE San Felipe 250 is now in its 33rd year and in 2019, the race is a game changer for those teams hunting for a championship season. Aside from gaining valuable points for the season, it has traditionally been established as a short sprint race averaging 250-miles throughout its history. In recent years, however, SCORE has implemented what the racers have requested and the course has slowly extended in mileage. In 2018 the race was 319-miles long and for the start of the 2019 season, it will now spread over a record distance of 350-miles. Aside from fans watching racers challenge a longer course, the 2019 SCORE San Felipe 250 will be one of the highlights of the SCORE racing season, as fans get to see new teams, more entries, and get a better experience with a two-day contingency that allows them to meet and see racers and their vehicles in person. This season opener takes place April 3rd-7th and has its share of racers who are won the race multiple times. The leader is 72-year-old veteran motorcycle racer Jim O’Neal, who has won the race a total of 18 times in various classes. The last one was in 2018 riding with the 360x Pro Moto 30 team led by Santiago Creel, battling against racers nearly half his age. While many Class 11 racers have a difficult time challenging the Baja desert, Eric Solorzano knows San Felipe well enough to have won the race eleven times in his SCORE racing career. Solorzano’s last SCORE San Felipe class win was in 2017 and fans of the Class 11 VW Bugs are anxious to see him cross the finish line again this year. Currently, the reigning SCORE Trophy Truck champion of the SCORE San Felipe 250 is Rob MacCachren, who has won the race six times overall within this division. If you count his numerous class wins in this race, MacCachren has won the SCORE San Felipe 250 10-times throughout his career. His last win was in 2018 where he battled with second place finisher Cameron Steele who started last year’s race first ahead of the class, and finished first physically but didn’t have the time to beat MacCachren. For those who know the history of these two racers who have battled over the course of the last two seasons, the 33rd SCORE San Felipe will be exciting to watch how Steele and MacCachren will handle a longer course. While these two SCORE Trophy Truck veterans are definitely favored to take the victory, one can’t count out Gus “Tavo” Vildosola. While Vildosola took some time off last season, he will be returning to SCORE driving a new Ford Raptor Trophy Truck. Vildosola has won the SCORE, San Felipe, three times in a row (2013, 2014, 2015), and with a new truck, SCORE fans can count on Vildosola being a top contender for winning this race. To the anticipation of fans, the McMillin family of racers will also be participating at the 33rd SCORE San Felipe 250. Andy McMillin and his cousins Luke and Dan McMillin have participated in more SCORE races this past season and have shaken-up the SCORE Trophy Truck class with their talent and potential for winning races. Luke McMillin finished third at last year’s SCORE San Felipe race and added a second place finish at the SCORE Baja 500. Andy McMillin finished fourth in this race last season while Dan McMillin finished in sixth place. Pro Moto Classes Gear Up For San Felipe In the Pro Moto Unlimited class, motorcycle fans will be waiting to see how the top off-road motorcycle racers will team up for the 2019 season. Last year, Justin Morgan and Mark Samuels teamed up for the race and won it. Then they went on to dominate the entire 2018 SCORE season winning the Pro Moto Unlimited championship and the Overall at the SCORE Baja 1000. Within a tremendous pool of talented riders, the SCORE San Felipe 250 will set the stage to watch these riders compete for the rest of the season. More UTVs On The Starting Line The SCORE Pro UTV classes continue to grow with amazing upgraded vehicles and the drivers who are taking them to their limits of speed and traction. At last year’s SCORE, San Felipe 250, Wayne and Kristen Matlock both won their classes in Pro UTV FI and Pro UTV NA. The husband and wife team are still the favored competitors to win, but the challengers are faster and just as talented. UTV fans also expect to see Brandon Sims, Cory Sappington, Marc Burnett, and Brandon Schueler give Wayne Matlock a difficult time within the FI division. Although the competition will be tough, there’s no doubt that Kristen Matlock could finish first in front of all of SCORE’s UTV classes and dominate the season.